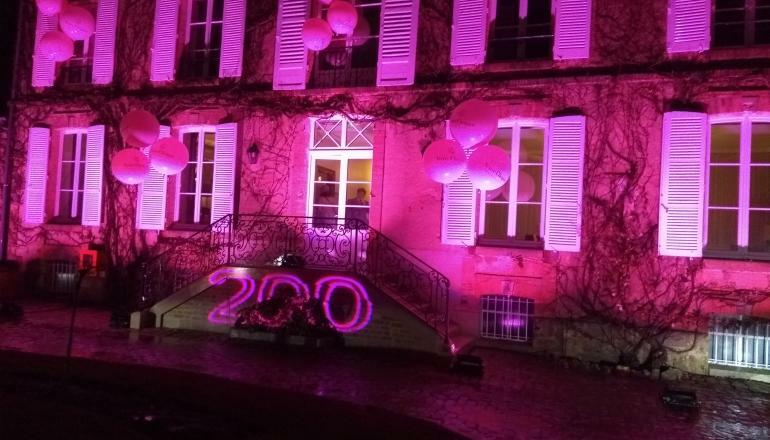 I had the most extraordinary privilege of being a guest at Veuve Clicquot recently to celebrate the 200th anniversary of their rosé champagne. Way back in 1818 the ambitious, assertive, dynamic and trail blazing Madame Clicquot pioneered the art of blending red wine with the white base assemblage to create a sparkling pink. Our day at Veuve Clicquot was to be spent learning how both the quality and quantity of that red base wine affects the blend and ultimately how well rosé champagne ages; it’s not the frivolous frippery some people might perceive it to be but rather a wine with incredible complexity, grace, ageability and stamina. The first tasting of the day was hosted by chef du cave Dominique Demarville and held at the stunning Veuve-owned Hôtel du Marc which housed a treasure-trove not just of branded Clicquot ‘toys’ such as a dartboard and baby-foot table but some amazing art too from the likes of Yayoi Kusama. And a giant ostrich! It was also where we learnt very clearly which style of red wine marries best with each of the different Veuve rosés. Unsurprisingly the red wine (which tends to be around 95% pinot noir and 5% meunier) for the non-vintage rosé is juicy, vibrant and full of lifted, almost leafy red berry fruits with focused, taut acidity. By contract the 100% pinot noir for the vintage blends is deeper and denser with darker damson fruit. The icing on the cake however was the Bouzy Clos Colin red exclusively from their own vineyard which is for the La Grande Dame Rosé. This was incredibly lifted and fragrant with distinct notes of Morello and maraschino cherries. Rounded, flavourful and utterly delicious. All of the red wines were from the 2017 vintage and next up was a blind tasting of the same wines (a NV base blend, a vintage and La Grande Dame), all from the 2016 vintage and we had to try and identify them. Luckily, given the distinct differences between the three wines that was fairly straightforward with those cherry notes giving the Clos Colin away and the crunchier fruit the NV. The final tasting before lunch was to taste three champagnes (in black glasses so the depth of colour couldn’t help us) with different amounts of red wine in – 12, 13 and 14% and to see what our preference was. The usual amount is around 13-14%. Having worked up a bit of a hunger, we were then treated to a ‘lunch of a lifetime’. The legendary French chef, and friend of the house, Joel Robuchon flew in from Hong Kong and was in charge of the kitchen and it was with lunch that we could see without a doubt that first class rosé makes the most incredible food wine. Our aperitif was the La Grande Dame Rosé 2006 (with 14% of Clos Colin red wine in), and as it opened out over the course of the lunch, the incredible savoury, nutty, autolytic notes were sensational with an archichoke and fois gras salad. The vintage 2008 rosé was enjoyed with truffled ravioli and blanquette de veau though I also tried the La Grande Dame 2006 with those courses too which I slightly preferred. Finally we were treated to Bouzy Rouge 1955 out of magnum with cheese and a Rich Rosé (served as is the fashion with a slice of lime and ice) with a red fruit mousse. After lunch we had a quick trip to the Bouzy vineyard followed by a tasting at the winery where we tried three different vintages of the Clos Colin still red wines; 2016, 2015 and 2012 followed by a mind-blowing tasting of Cave Privée Rosé 1990, 1989, 1979 and 1978 interspersed with Vintage Rosé 1985, 1961 and 1947. It’s almost impossible to pick a favourite wine as they were each so unique but what was really interesting was the ageability of all of the wines and stability of the colour. If I had to pick a few favourites then I would plump for the Cave Privée Rosé 1990 which was so powerful yet with fresh acid and the 1978 which was layered and mysterious and finally the breath taking Rosé 1947 - my parent’s birth year - that had been disgorged that morning and was sitting at 0% dosage. The day ended with a short journey to the Manoir de Verzy where we were treated to a final dinner and all of the three different champagnes we enjoyed were served out of jéroboams; the equivalent of four standard bottles. To commemorate the 200th anniversary of their first rosé champagne, Veuve launched the non-vintage rosé in jeroboam and we were amongst the first in the world to try it! We also enjoyed the La Grande Dame Rosé 2004 and 1990, both of which were complex, layered, vibrant and exceptional, especially the 1990. The evening concluded with a surprise, a glass of (LVMH owned) Domaine des Lambrays Clos des Lambrays Grand Cru 2009 to show, as if we needed reminding, the majesty and magic of pinot noir which plays such a great part in the base and blends of these seductive and utterly compelling wines. Just, WOW…..what a day, what an experience, what wines.